You've probably already noticed that in the coordinate plane, the x- and y-axes split up the plane into 4 different regions. Each region is called a quadrant. Interact with the applet below, then answer the questions that follow. 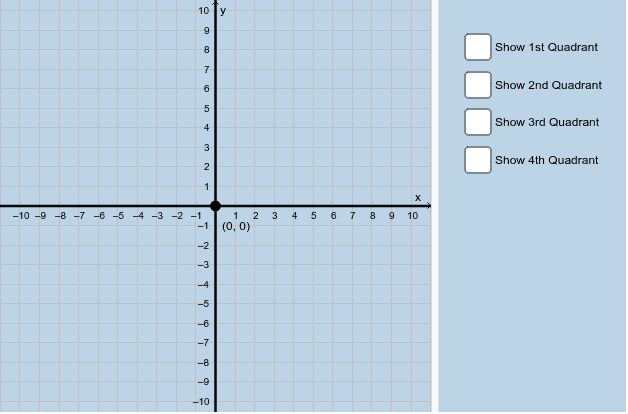 What property do all the points (x,y) in first quadrant have in common? Explain. What property do all the points (x,y) in the second quadrant have in common? Explain. What property do all the points (x,y) in the third quadrant have in common? Explain. What property do all the points (x,y) in the fourth quadrant have in common? Explain.